When walking by the benches at a shooting range, one will usually find a lineup of gentlemen taking their best shots from the bench, trying their darndest to make that “cloverleaf” of holes in the paper target 100 yards away. Trying to shoot a tight group is so enticing these days, especially with the fine accuracy we have in 21st century bolt-action rifles. However, for those trophy whitetails hunters who are sincerely out to improve their accuracy in the field, they should seriously consider getting off the bench. That is, they should practice some of the five shooting positions in rifle shooting: standing or offhand, kneeling, squatting, sitting or prone. I am probably like most hunters in that I’ve yet to shoot at deer at 100 yards—to the mark—and from a shooting bench. Try this. Instead of a fancy rifle target, just tack up three or four paper plates on the target backing. Then, instead of attempting to hit the bulls-eye shot after shot, try to hit the paper plate shooting from your favorite shooting position as you would shoot a deer in the field. The prone position—lying flat—is obviously the most accurate position. However, it isn’t always possible. 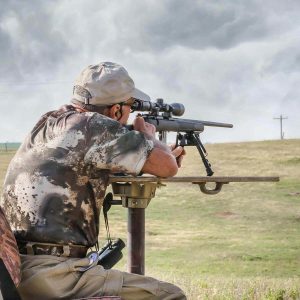 Consider a prone shot on a whitetail standing in a corn field. So, try some offhand. Try some kneeling. Having trouble even hitting the plate shooting offhand from 100 yards? Move up the 50 yards, if the range master allows it, and then try it. Make some games of it with your buddies. Have some fun. After all, it will be more challenging. And so will hitting trophy whitetails in the fall. But you’ll be ready since you’ve practiced these different positions.